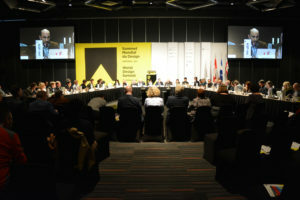 The process for the international Design Summit Meeting format began in 2010 with the establishment of a steering committee including representatives from three international organisations: International Council of Design (ico-D), International Federation of Housing and Planning (IFHP) and International Federation of Landscape Architects (IFLA). Two Pre-Summit Meetings were held in Paris in 2017 and four Working Committees were established: Social, Cultural, Environmental and Economic, to collaboratively draft the Declaration and identify potential projects. 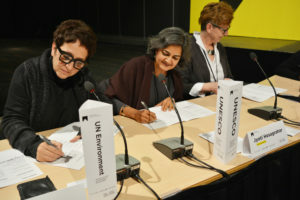 The meeting was concluded with the signature of the first ever Design Declaration, the Montréal Design Declaration. 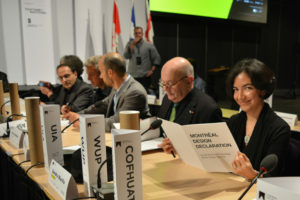 The Design Declaration Summit was conducted within the framework of the “World Design Summit,” an event held at the Palais des Congrès in Montréal, including a multidisciplinary Congress and Exhibition. The signing ceremony was conducted on 24 October 2017 in the presence of three UN agencies (UNESCO, UN-Habitat, UN Environment). The Declaration proclaims the potential of design to achieve global economic, social, environmental and cultural objectives and includes a dramatic call to action to professionals, educators and governments as well as a list of proposed projects. David Grossman, Past President of the International Council of Design (ico-D) stated that “the Declaration reflects two grand achievements. For the first time, the design community, across many disciplines, is speaking with one voice. This consolidation permits the second achievement: the international agencies are eager to collaborate with a united design world. These achievements impact every designer.” The Montréal Design Declaration lists in an Annex more than 700 national professional associations, universities and design promotion entities, from 90 countries, that are represented by these international organisations. The first Design Declaration is a “Call to Action”. On one hand, it is a call to governments, educators, civil and private sectors to engage with design, and utilise and recognise it through Design Advocacy, Development of Design Metrics, Development of Design Policies, Development of Design Standards and Enhancement of Design Education. It is also a call to designers themselves to step into a leadership role, reconceiving themselves as “ambassadors” of end-users, calling for more responsive, responsible and vigilant design, and to recognise design in the face of global challenges. The first Design Summit Meeting set a baseline, a general framework for the international cooperation of design and non-design entities towards designing a better world. Future Design Declaration Summits, in other global cities in 2020 and 2023, will focus on specific topics (for instance environment, globalisation or social equality) or industries. Would you like to host a Design Declaration Meeting in your City? Submit your interest in participating in the Pre-Summit Meeting via our Contact page. INTERESTED IN HOSTING THE NEXT SUMMIT?